BIG SALE!! LARGE GEMSTONE SPHERES BIG SALE!! Blue Anhydrite, known as Angelite is a new satin smooth gem stone discovered in Peru at the time of the Harmonic Convergence in 1987. It has become a very popular healing stone and a symbol of global love and light represented by the Harmonic Convergence. 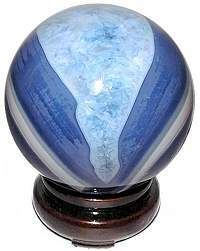 Peru Angelite 52mm and 60mm or 2 1/8" to 2 1/2" spheres with beautiful satin polished finish. The Oriental Rosewood Stand is sold separately. Crystal master believe Bloodstone is a very powerful healing stone and has wonderful grounding and balancing properties. Bloodstone is also known as Heliotrope. 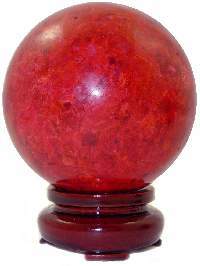 These rare large Bloodstone spheres are from India and contain small "drops" of Red Jasper. 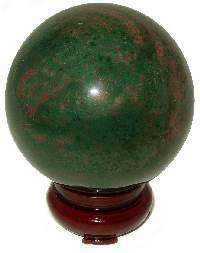 High quality AA Bloodstone 55mm to 70mm spheres have an excellent polished finish. The Oriental Rosewood Stand is sold separately. 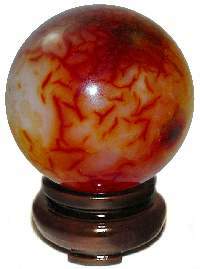 These superbly polished A Madagascar Carnelian spheres have deep orange and red tones coupled with a translucent cream/grey glassy backdrop. Carnelian is believed to protect against envy, fear, and rage, and helps to banish sorrow from the emotions. The Walnut Finish Oriental Stand is included. These exquisite AA Madagascar Carnelian spheres have beautifully formed open geodes. These Carnelian spheres have delicate to intense orange and red hues on a translucent cream/grey glassy backdrop. Carnelian is believed to protect against envy, fear, and rage, and helps to banish sorrow from the emotions. Get this one before it's gone!! The Oriental Rosewood Stand is sold separately. 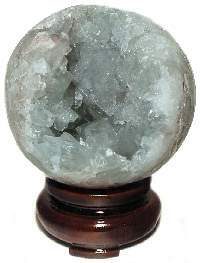 AA Madagascar Blue Celestite Geode sphere has large beautifully formed prismatic crystals. Celestite is greatly sought after as a spiritual stone, it is said to facilitate higher meditation, cleanse negative energies in one's surroundings and increase sensitivity to the higher self and angel guardians. Get them before they are gone! The Oriental Rosewood Stand is sold separately. 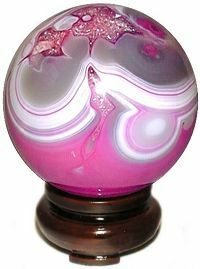 Rare Brazilian Dyed Pink Agate 55mm-60mm spheres. The pink draws out the amazing asymmetrical banding and translucent crystal formations. In Gem Lore, Agate is valued as a soothing stabilizer and grounding stone, which directs the focus toward fine detail and final outcome. 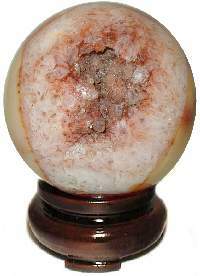 Brazilian Pink Agate spheres with beautiful glass like polished finish. The Oriental Rosewood Stand is sold separately. 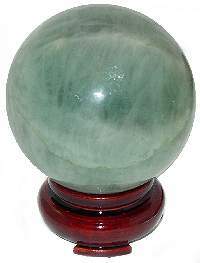 Lovely Brazilian Dyed Green Agate 60mm spheres. The green draws out the amazing asymmetrical banding and translucent crystal formations. Agate is considered a hard stone form of Chalcedony and is prized for its artistic banding and formations. 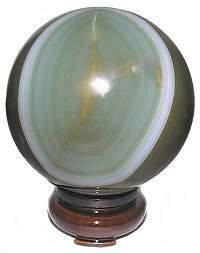 Brazilian Green Agate spheres with beautiful glass like polished finish. The Oriental Rosewood Stand is sold separately. Beautiful Brazilian Dyed Purple Agate 70mm spheres with amazing asymmetrical banding and translucent honeycomb crystal formations. Agate is a Chalcedony which is part of the Quartz family. In Gem Lore, Agate is valued as a soothing stabilizer and grounding stone, which directs the focus toward fine detail and final outcome. 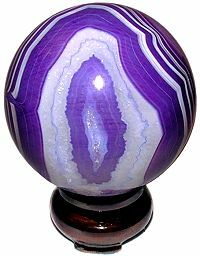 Brazilian Purple Agate spheres with beautiful glass like polished finish. The Oriental Rosewood Stand is sold separately. Dazzling, neon blue Apatite 70mm spheres from Madagascar have a translucent gemmy appearance. Apatite grows in hexagonal crystals in many colors and mimics other stones. Crystal masters use Blue Apatite for its high level of spiritual guidance and strong healing qualities. Hand cut and polished in Madagascar, just a few available. The Oriental Rosewood Stand is sold separately. These A Aquamarine spheres with excellent iridescent color and finish are rare treasures! Aquamarine is a variety of Beryl, also known as Emerald when it appears as green crystals. It is a stone of courage and accelerates the intellectual and reasoning processes leading to better assimilation of the knowledge sought. A Aquamarine 55mm spheres from India with an excellent polished finish and no cracks. The Oriental Rosewood Stand is sold separately. Charoite has vibrant, eye catching iridescence. Charoite is a rare gemstone found only by the Chary River in Russia, hence its name. It forms beautiful swirls in the full palette of mauves, lavenders and purples. 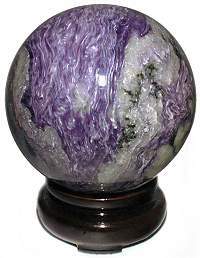 Charoite is now extremely rare, so if you've been looking for a quality Charoite sphere get one before they are gone! 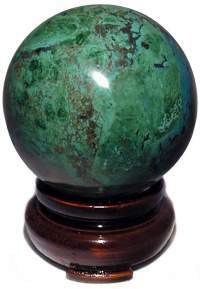 Rare 55mm or 2 1/4" Chrysocolla spheres from Peru show exceptional quality. Chrysocolla crystals are usually intergrown with quartz and opal. It has a bright bluish green appearance with occasional copper patches. 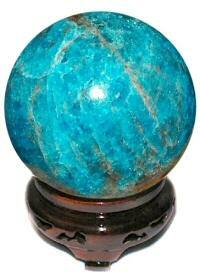 Chrysocolla is said to eliminate negativity in the home or environment as well as having healing properties. The Oriental Rosewood Stand is sold separately. Rare Brazilian Dyed Red Agate 60mm spheres with amazing asymmetrical banding and translucent blue honeycomb crystal formations. Agate is a Chalcedony which is part of the Quartz family. It is prized by collectors for its infinite variety of artistic banding and formations. 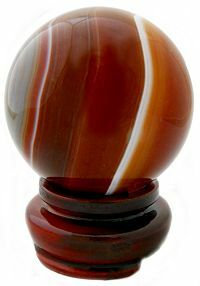 Brazilian Red Agate spheres with beautiful glass like polished finish. The Oriental Rosewood Stand is sold separately. Stunning Brazilian Dyed Blue Agate 60mm spheres with amazing asymmetrical banding and translucent blue honeycomb crystal formations. Agate is a Chalcedony which is part of the Quartz family. It is prized by collectors for its infinite variety of artistic banding and crystal formations. In Gem Lore, Agate is valued as a soothing stabilizer and grounding stone, which directs the focus toward fine detail and final outcome. 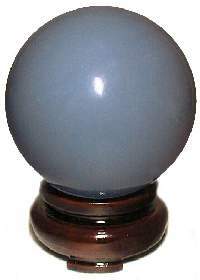 Brazilian Blue Agate spheres with beautiful glass like polished finish. The Oriental Rosewood Stand is sold separately. Coral is an organically formed stone like Amber, but issuing from the sea. Red Coral is a stone of passion which attracts love and prosperity. Feng Shui Masters consider Red Coral a symbol of wealth, good fortune and high status. Red Coral was one of the seven treasures in Eastern scriptures and is still used for rosaries by Tibetan monks. Apart from its beauty and color, Red Coral is believed to engender a calm optimism which can lead to a sense of well being and inner peace. The Oriental Rosewood Stand is sold separately.